Many of us advocate and spread awareness every day of the year, but October is Down Syndrome Awareness Month, and a time for support groups and families to step up their advocating efforts. 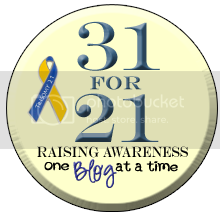 That's 31 whole days to educate others about what life with Down syndrome is really like. The 31 for 21 challenge, encourages us to share information about Down syndrome every day during the month, but we felt like we needed to do more. Since a picture is worth a thousand words, we designed some posters that we will be displaying throughout Lincoln in businesses during the month of October. Just $10 will sponsor a poster and we are currently looking for more sponsors to help us spread additional awareness in the Lincoln area. If you would like your child featured on a poster, just email a photo to us at dsaaofne@gmail.com, and let us know which poster style you like best. We will send you a digital version to share socially. Printed posters will be ready in just a couple days and you can choose to post them in your favorite establishments, or let us post them in various spots around Lincoln. You can already see posters at the ARC, Nebraska VR, Handprints & Footsteps, Easterday Rec Center, libraries and schools. If your school does not yet have a poster displayed, why not consider sponsoring one? To make the October Poster Campaign a bit more exciting, we decided to add a small contest. If you see one of these signs around town, take a selfie with it, and the first 5 people who tag @Down Syndrome Advocates in Action on Facebook, or @DSAA_NE on twitter will win their choice of a Down syndrome awareness button. Good Luck! The top chalkboard poster only comes in gray, but the subway style poster can be made in virtually any color. Here are a few of the buttons styles available or choose a custome button option.